I-SAPS organizes multi-disciplinary colloquium annually that brings scholars from diverse academic and conceptual backgrounds together to share their research and debate deep seated conceptual assumptions in the production of knowledge and its relevance with Pakistani social and political realities. The colloquia are planned in such a manner that encourages participants to draw lessons for public policy and its effective delivery with insights drawn from different disciples of social sciences. I-SAPS welcome theoretical and empirical contributions from historians, anthropologists, sociologists, political scientists, economists, psychologist, and development practitioners on a select theme of the colloquium each year. Societies have always been changing but the pace however appears to have accelerated in the last three hundred years. The social and human sciences have taken up the task of understanding and explaining the nature, direction, consequences, and ramifications of these changes for individuals, communities, states, and inter-state institutions and organizations. The scientific revolution, colonialism, the globalization of the state, the supra-state alliances of multinational corporations, and the initial retreat and the subsequent global assertion of tribal/pre-modern identities under the rubric of multiculturalism are some of the major signs and sites of societies being reconfigured. Societal transformations can result in major shifts in collective and individual subjectivities. Are the drivers of change endogenous or exogenous to a society? The answer to this question raises useful issues related to the role of religion, technology, state and other agents producing conflict or consensus. In case of Pakistan in particular and South Asia in general, should a society attempt to control the way in which it is being transformed? Societal transformations, sustained over time, can give completely new meanings to attitudes and values. 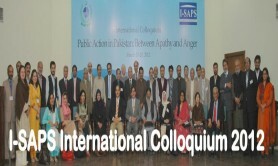 I-SAPS Colloquium 2013 aims at deepening the understanding of societal changes taking place in Pakistan and South Asia Through this Colloquium, I-SAPS seeks to contribute towards a nuanced understanding of the agents, causes and consequences of societal transformations with a special focus on Pakistan and South Asia.